As well as popping flowers in a vase, you can also pop them in the oven! Edible flowers are becoming increasingly popular with our food from prettying up our cakes and bakes to pepping up salads, jellies and cordials. But eating flowers isn’t just something fancy chefs and The Great British Bake Off have revived - medieval monks were using Calendula in their cooking pots and the Victorians topped desserts with candied Violets, associating them with elegance. Carnations, Day Lily and Nasturtium petals were also thought to be good for you with body-cleansing properties as well as attractive garnishes, says GardenGuides.com. Back in the day, breakfast was boring porridge. But now you can even enjoy a little piece of Spring for breakfast! This simple-to-make lemon yoghurt creme is topped off with almonds, blueberries, granola and vibrant pansies, nasturtiums and carnations to give it that wow factor. Inspired by this year’s Great British Bake Off botanical week? Then cook up this colourful flower petal confetti cake. A rainbow showstopper perfect for a party or make it for your wedding anniversary to remind you of your big day and the confetti that got everywhere! Remember when afternoon tea was a cake slice and a cuppa? Now it’s turned into a banquet with sandwiches, scones, macaroons and Prosecco! 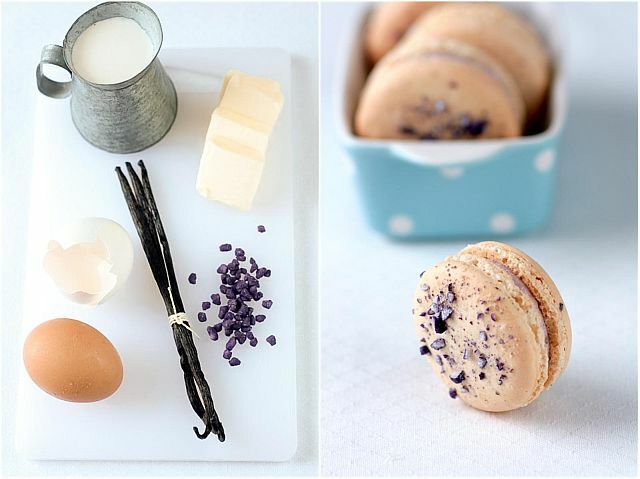 Treat yourself to afternoon tea at home with these dainty macarons, topped off with tempting violets and an indulgent buttercream. Remember granny making endless jars of chutney and crab-apple jelly? Give scones or cheese an extra zing with this delicious sweet and sour relish that can be made with scented fresh or dried rose petals. So if the winter weather’s getting you down, make your bakes blossom with a splash of spring colour! FREE delivery available on Flying Flowers items. Delivery is via Royal Mail and may take up to 2 days, with the exception of hampers where free delivery is via courier.Other delivery services are available at an additional cost and subject to availability. Some delivery services may not be available in all areas and may be withdrawn at busy times. See Terms and Conditions for full details. *Free Handmade Chocolates (6 assorted chocolates) offer expires at 23:59 on Friday 17th May, applies to floral bouquets and plants only and cannot be used in conjunction with any other offer. Free Handmade Chocolates will be automatically applied to basket when code CHOCCY is entered. Offer excludes, Interflora, Help for Heroes, Good Housekeeping, Prima and International Collections. If you created an account before 2017, we have made some improvements which require you to sign up again. Yes, I would like to receive offers, updates and marketing from Flying Flowers via email, post and online advertising. If you wish to opt out simply untick the pre-ticked box. Alternatively, you can tell us how you’d like to hear from us. via email, post and online advertising. If you wish to opt out simply untick the pre-ticked box. We will treat your personal information with respect and use it as detailed in our Privacy and Cookie Policies.